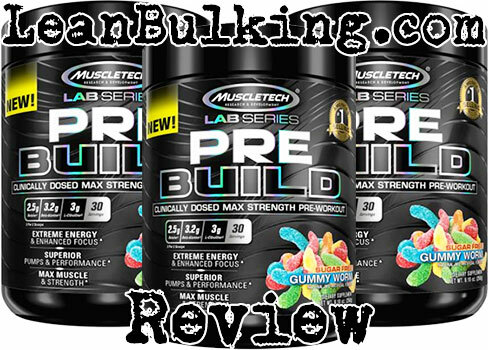 MuscleTech PRE BUILD Review | Expert Pre-Workout Analysis | Worth It? 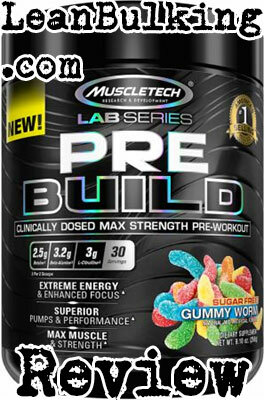 Pre Build is a pre-workout supplement made by MuscleTech. It was released late in 2017, and is priced at $34.99 for 30 serving, making it very reasonably priced for customers. As MuscleTech have such a great reputation in the supplements industry, it's always big news when they market new products. We have big expectations for this product, so we'll be analyzing Pre Build's nutrient profile in the next section to see how safe and effective it is (in our honest opinion). But first, we'll give those new to supplements some more information about the company behind it. As we've already mentioned, MuscleTech are one of the biggest companies in the supplements industry. They've built a great reputation through numerous products, especially their 'Hydroxycut' line of fat burners. MuscleTech Pre Build contains 11 ingredients, which is on the border of being 'too much' in our opinion; this is because most products that contain over 10 nutrients that we've reviewed have been under-dosed. This concern is emphasized after seeing that L-Citrulline has been dosed at 1.5g instead of the optimal 3g needed to deliver its best effects (enhanced muscle pumps). But on a positive note, we can see that there is an optimal dosage of Beta-Alanine and we're also happy that MuscleTech Pre Build doesn't contain any proprietary blends; this means you can see the exact dosages of each ingredient inside. Anyway, we'll expand on this as we take you through each ingredient in MuscleTech Pre Build. By the end of this review, you'll have a good idea of how safe and effective this supplement really is. Beta-Alanine is a controversial ingredient, as it's both beneficial and can cause side effects; while Beta-Alanine has shown to improve your muscular endurance, it's also known for causing itchy & tingly skin. Personally, we find this side effect (officially known as paresthesia) to be very distracting when trying to focus on lifting weights in the gym. But we know that others don't find it as bad, so we'll leave it up to personal preference. Ultimately, MuscleTech have done well to do their research, as we'll repeat that MuscleTech Pre Build has shown to enhance your muscular endurance in the gym. Most people know about Taurine, even if they don't know about supplements. This is because this nutrient is commonly found in energy drinks. However, contrary to popular belief, Taurine is not able to raise your energy levels. Instead, Taurine's main benefit is that it's able to prevent cramping during exercise. Simply put, this is a useful benefit, but it's not an essential reason you'd choose to consume pre-workout supplements. As a result, we consider Taurine to be a good 'bonus' addition to Pre Build here. L-Citrulline is a great addition to any pre-workout supplement, as studies have proven that it's able to enhance your muscle pumps while you lift weights; with this being one of Arnold Schwarzenegger's favorite things about lifting weights, it's always a useful benefit. But muscle pumps do more than just make you feel and look good. Basically, as more blood and oxygen is being pumped into your muscles, you experience less fatigue and muscle damage too. However, the bad news is that L-Citrulline has only shown to work when consumed in dosages of 3,000mg (3g) or more. As MuscleTech Pre Build only contains 1.5g, it's not likely to offer its full benefits here. Not only that, we would recommend that companies add Citrulline Malate instead of L-Citrulline; Citrulline Malate is simply L-Citrulline bound with Malic Acid, which allows it to boost your ATP levels and enhance your strength in the gym too (in a similar way that Creatine Monohydrate works). In case you're wondering, this is a patented form of grape and apple extracts. But it's more useful than it seems; Grape Extract contains high amounts of nitrates, which enables it to raise your nitric oxide levels and improve your blood flow, resulting in enhanced muscle pumps. This might be the reason why MuscleTech have added a smaller 1.5g serving of L-Citrulline in MuscleTech Pre Build. However, in our honest opinion, we believe that L-Citrulline is more reliable as it's been covered in more studies. But in all fairness, ViNitrox seems effective, although we don't know what dosage it's most effective in. More bad news is that Betaine Anhydrous hasn't shown to reliably offer benefits to improve your gym session in enough studies. For this reason, we consider Betaine Anhydrous to be mostly an ineffective addition to pre-workout supplements, in our honest opinion. Ultimately, we would have preferred MuscleTech to have added more useful nutrients such as Creatine Monohydrate instead (which is proven to boost your strength and endurance levels). We'll hold our hands up here, as we don't know much about Galangal Extract; this is because it's not commonly added to pre-workout supplements or other products in the industry. After doing our research, we found that Galangal Extract is believed to improve your digestion and even prevent cancer. Now, there aren't enough studies to prove whether it works or not, so we can't determine how effective Galangal Extract is in MuscleTech Pre Build. But personally, we would have preferred to see a tried-and-tested nutrient such as Creatine Monohydrate instead. Choline Bitartrate has the same problem as Betaine Anhydrous; it's been commonly reported to cause fishy breath and sweat after consumption (see study we've included in the Betaine section for more info). Basically, Choline is added into pre-workouts as it's believed to improve your brain function and support healthy energy levels. But if you're looking to increase your energy levels, then Caffeine Anhydrous is the best nutrient to consume. Fortunately, MuscleTech has included Caffeine Anhydrous in MuscleTech Pre Build, which we'll analyze later in this section. Ashwagandha is an interesting herb that's been used for decades in ayurveda (Traditional Indian Medicine). It's shown to have slightly positive effects on your strength levels, which can improve your gym session. However, if you're looking to have noticable effects on your strength levels, Creatine Monohydrate is a more reliable option. 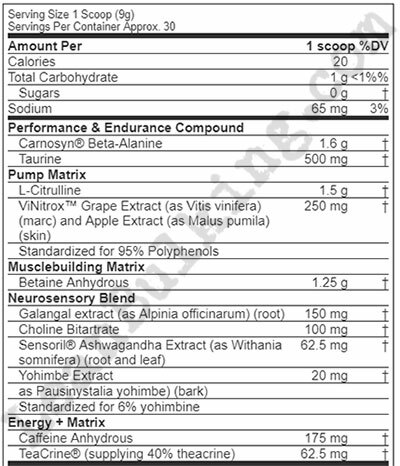 Yohimbe Bark Extract is the worst ingredient in MuscleTech Pre Build in our honest opinion. This is because it's commonly reported to cause numerous side effects including anxiety and nausea. Why? Because Yohimbe Bark Extract contains a chemical called Synephrine, which has been banned from being directly added into supplements. Basically, companies pass through a legal loophole by adding Synephrine indirectly through Yohimbe Bark Extract, as this hasn't been banned (although we believe it will be banned from use in the future). So what does it do? Well, Yohime Bark Extract has shown to have slightly positive effects on fat loss. But there's no point risking your health when there are safe and effective fat burning nutrients available such as Green Tea Extract. In fact, if your main aim is to lose body fat, then you'll benefit more from using fat burner supplements. We mentioned briefly before that Caffeine Anhydrous is the best stimulant to consume when aiming to raise your energy levels. Well, this is because Caffeine Anhydrous is a pure form of caffeine; it's actually caffeine dehydrated into powder form so it can be added to supplements, which is why it's called 'Anhydrous'. However, you'll know that consuming too much can lead to jittery side effects if you've ever had too much coffee before. Now, you can avoid any risk of jittery side effects by consuming under 200mg Caffeine Anhydrous per serving in pre-workout supplements. The good news is that MuscleTech Pre Build contains 175mg, so you should be safe here. If you're wondering, this is a patented form of Theacrine, which is a stimulant similar to Caffeine that's able to raise your energy levels. You already know that MuscleTech Pre Build contains 175mg Caffeine Anhydrous. But as there's a 62.5mg Teacrine in MuscleTech Pre Build too, you're risk of suffering from jittery side effects is increased - especially if you're sensitive to stimulants. Ultimately, we advise you to choose pre-workouts that contain only 1 source of stimulant to avoid risk of jittery side effects. The majority of MuscleTech Pre Build's ingredients are free from side effects. However, there are a few that raise some concerns, such as Yohimbe Bark Extract and the fact this pre-workout contains 2 sources of stimulants. In quick summary; Yohimbe Bark Extract has been reported to cause numerous side effects including nausea and anxiety, while consuming more than 1 stimulant can raise your risk from suffering jittery side effects. We might sound like we've been critical of MuscleTech Pre Build. But remember that we're an expert review site that analyzes everything about each supplement we review. There are actually many positive things about this pre-workout supplement; we especially like that it contains L-Citrulline and a sensible dosage of Caffeine Anhydrous. However, things you can't ignore are that MuscleTech Pre Build also contains potentially harmful ingredients such as Yohimbe Bark Extract. Bottom Line: While MuscleTech Pre Build is a very respectable product from one of the top supplement companies in the industry, we personally don't believe it competes with the highest rated pre-workouts on the market.